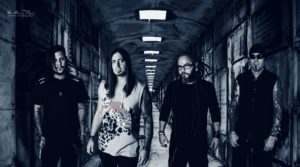 Asleep in the Wake is an American rock band from Houston, TX that formed April of 2018 after Grammy nominated drummer Paul Crosby left the Multi-platinum rock band Saliva to focus on new musical ventures. Mike Mexas (guitar) and Hector Porras (bass) were in a regional touring band called Saturate which disbanded after 10 years and they wanted to start something new as well. So we all teamed up and recruited former Melovine vocalist Matt Neice. The remaining members of Melovine went on to form the band To whom it may. The band has already recorded most of our debut album and our first single “Like you” was released on August 31st, 2018. They will be shooting the video for the single on September 15th. They will be touring extensively this fall to support the single/album release.